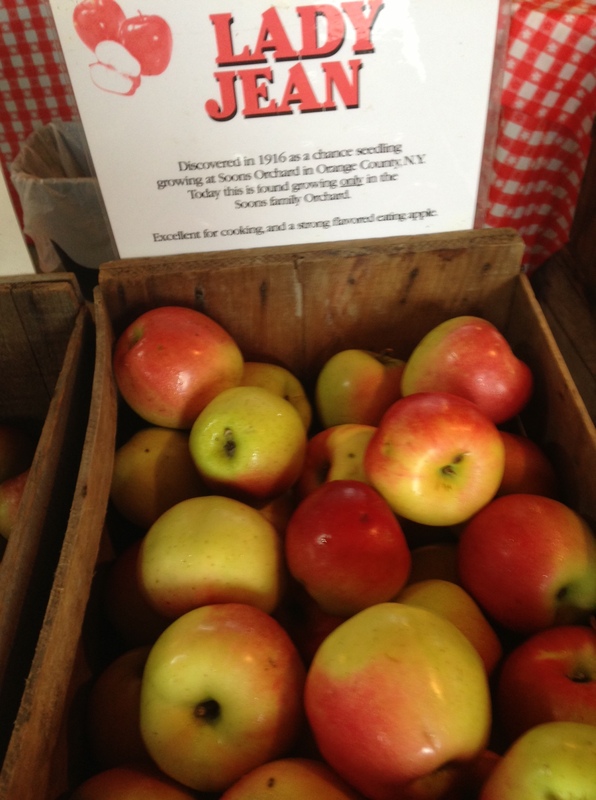 I am inspired by a cider mill down the road that sells heirloom apples, some of which it grows and some it brings in. Weathered wooden crates hold one to two dozen varieties, bright green to deep red, all labeled with their place and date of origin. At Thompson Cider Mill I can find apples of the perfect flavor and shape and texture to bake into the dessert I call Apple Bombs, flaky pastry fixed in a package around a whole cored apple stuffed with butter and brown sugar, so that each dinner has their own individual, spherical apple pie. There is an intense, hard, black apple that looks beautiful in a bowl on the table. It’s so vintage, you feel you’d have to go through a worm hole back in time (not through the apple) to find it, but here it is for you in a neat shed in 2012, ready to be collected into your shopping basket. The Apples of New York, published before the turn of the 20th century by Spencer Ambrose Beach and now digitized, spells out nearly 400 varieties of the fruit, with lavish illustrations. It is the Audobon of apples. Thompson Cider Mill has all new machinery to press its complex, perfumey cider. 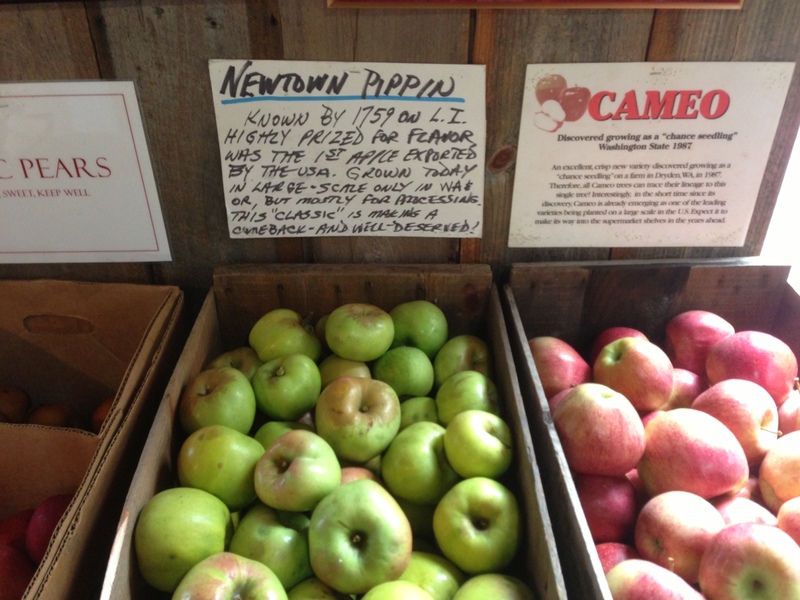 You could be drinking a combination of a dozen or more varieties, including Macoun, McIntosh, Rhode Island Greening, Northwest Greening, Jonagold, Winter Banana, Golden Russet, Idared, Winesap, Jonathan, Mutsu, Monroe, Baldwin, Fuji, Cortland, Spygold, Red Spy, Northern Spy, Pippin, Seek-No-Further, or local Golden or Red Delicious. When you take a sip, you’re drinking history. Maybe I like the place so much because I can find my namesake fruit there. ‘The apple of my eye’ is exceedingly old and first appears in Old English in a work attributed to King Aelfred (the Great) of Wessex, AD 885, entitled Gregory’s Pastoral Care.